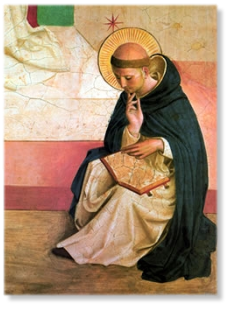 The spirituality of the Dominican Order means living the religious life as it is prescribed in the Rule of St. Augustine, the Constitutions, and the family customs which have developed over the centuries. If the Dominican lives these things established for him/her, he/she follows a spirituality that will lead him/her to salvation. A total view of Dominican life requires that we regard it as a single, double-phased movement like charity itself. Its vertical phase seeks to establish a contemplative presence to God in faith and love; its horizontal phase, to set up an apostolic presence to neighbor, also in faith and love. In its vertical phase charity carries the Dominican upward to God, bear him upward until his faith pierces de veil of heaven. This upward trust aims at more than an incidental meeting, because God himself bends downward to his creature. The vertical phase of Dominican life is being alone with God, yet alone with Him in a community that seeks Him. Each entered the Order to search for God earnestly, encounter Him more frequently, dialogue with Christ more intensely. The religious wants and has a right to the recollection, silence and prayer, to the total contemplative environment that conduces to openness to God that leads in faith and charity to Him. The vertical phase of Dominican life makes its horizontal phase fruitful – the horizontal thrust that pushes outward and sideward in all directions to the neighbor. The Dominican works authentically for his neighbor when he sincerely seeks God. The religious must reach into his/her heart, grasp the torch that burns there, and hold it up to the world! For he/she is no more that the keeper of the light, made of the same substance as his brothers and sisters, but living among them as a source and living proof of the Light of Christ that smolder’s in the heart of every human being. Extracts from: Dominican Spirituality by Fr. William Hinnebusch O.P.